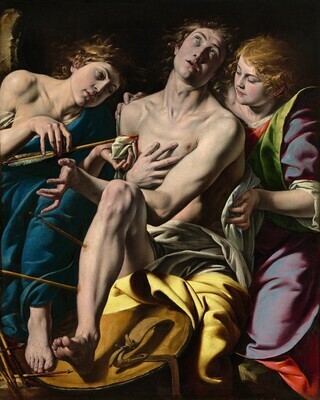 A fevered intensity in this portraval of Saint Sebastian marks it as a characteristic work by Tanzio, whose native village of Varallo in the mountains north of Milan was a major center of popular piety. The painter has shown Sebastian, who was persecuted as a Christian under Diocletian, being rescued by angels after the assault on him by the Emperor's archers. The thickset figure at the right who tenderly steadies Sebastian's body for the angel's ministrations may be Saint Irene, who nursed the martyr back to health. The visual excitement of Tanzio's portrayal serves to convey Sebastian's state of emotional transport and transcendence of bodily pain. Contributing to the fervid drama is the extreme compression of the composition. Tanzio's large, solid forms are crowded by the frame, seeming to twist and strain to fit its confines. If the vivid illusionism and sharp contrasts of light and dark -- pulsating in the drapery across Sebastian's lap and in the spiky patterns of expressively tapering fingers -- reveal a study of Caravaggio's art, Tanzio's use of discordant colors is uniquely his own. (Tomei, Milan, 1916). Achillito Chiesa, Milan, by 1922 until at least 1924. (Count Alessandro Contini-Bonacossi, Florence); purchased 1935 by the Samuel H. Kress Foundation, New York; gift 1939 to NGA. Roberto Longhi, Scritti giovanili, 2 vols., Florence, 1961: 511, took credit for changing the attribution from Rubens to Tanzio in 1916 when the painting was owned by "l'antiquario Tomei." Listed as the owner in the 1922 Palazzo Pitti catalogue; following Chiesa's bankruptcy, the collection was dissolved at several sales in New York and Europe beginning in 1924: see Wesley Towner, The Elegant Auctioneers, New York, 1970: 382-383, 412- 414. The painting does not appear in the New York sale catalogues. According to Fern Rusk Shapley, Paintings in the Samuel H. Kress Collection: Italian Schools XVI-XVIII Century, London, 1973: 81, and Fern Rusk Shapley, Catalogue of Italian Paintings, 2 vols., Washington, D.C., 1979: 1:439. Mostra della pittura italiana del seicento e del settecento, Palazzo Pitti, Florence, 1922, no. 962. Art's Lament: Creativity in the Face of Death, Isabella Stewart Gardner Museum, Boston; Bowdoin College Museum of Art, Brunswick, Maine, 1994, no. 6, repro. Caravaggio's 'The Taking of Christ': Saints and Sinners in Baroque Painting, National Gallery of Art, Washington, D.C., 1999, brochure, no. 4, repro. Tanzio da Varallo: Realismo fervore e contemplazione in un pittore del Seicento, Palazzo Reale, Milan, 2000, no. 8, repro. The support is a medium-weight, plain-weave fabric with unevenly spun threads. It was prepared with a white ground. Distinct impressions of the brushstrokes can be seen in the paint surface. X-radiographs show extensive changes in the white and green cloths draped over Saint Sebastian's legs, the blue robe of the angel, and the green drapery of Irene. A minor change is apparent in the curvature of the hand removing the arrow. The support was extended by a 2.5 cm wide fabric strip sewn along the bottom edge. At the top, left, and right, the paint surface has been extended by approximately 2.5 cm onto the lining fabric, and by 0.5 cm at the bottom. The original dimensions were closer to 112 x 90 cm, as verified by the cusping and tacking holes detected in x-radiographs. Extensive abrasion and paint loss have occurred in the drapery, legs, and faces, which were originally built up with glazes. The shadows and darker colors of the faces have been inpainted and Sebastian's green drapery has been repainted. The thick varnish is considerably discolored. The painting was relined, discolored varnish was removed, and the painting was restored by Stephen Pichetto in 1936. Kraehling, Victor. Saint Sebastian dans l'art. Paris, 1938: 40. Preliminary Catalogue of Paintings and Sculpture. National Gallery of Art, Washington, 1941: 190-191, no. 302. Book of Illustrations. National Gallery of Art, Washington, 1942: 245, repro. 192. Longhi, Roberto. "Ultimi studi sul Caravaggio e la sua cerchia." Proporzioni 1 (1943): 53, n. 66. Paintings and Sculpture from the Kress Collection. National Gallery of Art, Washington, 1945 (reprinted 1947, 1949): 134, repro. Bologna, Ferdinando. "Altre prvoe sul viaggio del Tanzio." Paragone 45 (1953): 43. Sandoz, Marc. "Ribera et le thème de Saint Sébastian soigné par Irène." In Journées internationales d'études d'art (Cahiers de Bordeaux) 2 (1955): 2:67. Dell'Acqua, Gian Alberto. "La pittura a Milano dalla metà del XVI secolo al 1630." In Storia di Milano. 17 vols. Milan, 1957: 10:772, 767, repro. Shapley, Fern Rusk. Comparisons in Art: A Companion to the National Gallery of Art, Washington, DC. London, 1957 (reprinted 1959): pl. 39. Paintings and Sculpture from the Samuel H. Kress Collection. National Gallery of Art, Washington, 1959: 224, repro. Rosci, Marco. "Two Altar-pieces by Tanzio da Varallo." The Burlington Magazine 101 (1959): 186. Testori, Giovanni. Tanzio da Varallo. Exh. cat. Palazzo Madama, Turin, 1959: 37, no. 12, fig. 62. Longhi, Roberto. Scritti giovanili. 2 vols. Florence, 1961: 1:511, fig. 259. Rosci, Marco. Mostra del Cerano. Novara, 1964: 63. Ruggeri, Ugo. "Un disegno inedito del Tanzio." Arte Lombarda 10/2 (1965): 98. Summary Catalogue of European Paintings and Sculpture. National Gallery of Art, Washington, 1965: 126. Moir, Alfred. The Italian Followers of Caravaggio. 2 vols. Cambridge, Massachusetts, 1967: 1:265; 2:110. Testori, Giovanni. Manieristi piemontesi e lombardi del '600. Milan, 1967: 32, fig. 25. European Paintings and Sculpture, Illustrations. National Gallery of Art, Washington, 1968: 112, repro. Pirovano, Carlo. La pittura in Lombardia. Milan, 1973: 150. Shapley, Fern Rusk. Paintings from the Samuel H. Kress Collection: Italian Schools, XVI-XVIII Century. London, 1973: 81-82, fig. 146. Zupnick, Irving. "Saint Sebastian. The Vicissitudes of the Hero as Martyr." In Concepts of the Hero in the Middle Ages and the Renaissance. Edited by Norman T. Burns and Christopher J. Regan. Albany, 1975: 257. Saint Sébastien dans l'histoire de l'art depuis le XVe siècle. Preface by Francois Le Targat. Paris, 1979: 202, 197 repro. Shapley, Fern Rusk. Catalogue of the Italian Paintings. 2 vols. National Gallery of Art, Washington, 1979: I:438-440, II:pl. 318. Szigethi, Agnes. "Early Seicento Paintings from Lombardy and Piedmont in Hungary." Müvészettötéeti értesitö 32 (1983): 47, 50, fig. 5 (in Hungarian with English summary). European Paintings: An Illustrated Catalogue. National Gallery of Art, Washington, 1985: 386, repro. Oklahoma Treasures: Paintings Drawings and Watercolors from Public and Private Collections. Exh. cat. Oklahoma Art Center, Oklahoma City; The Thomas Gilcrease Institute of American History and Art, Tulsa. Oklahoma City, 1986: 124. National Gallery of Art. National Gallery of Art, Washington. New York, 1992: 110, repro. Goldfarb, Hilliard T. Art's Lament. Creativity in the Face of Death. Exh. cat. Isabella Stewart Gardner Museum, Boston, 1994: color repro. Caravaggio and Tanzio: The Theme of St. John the Baptist. Exh. cat. The Philbrook Museum of Art, Tulsa, Oklahoma; The Nelson-Atkins Museum of Art, Kansas City. Kansas City, 1995: 25-27, fig. 15. De Grazia, Diane, and Eric Garberson, with Edgar Peters Bowron, Peter M. Lukehart, and Mitchell Merling. Italian Paintings of the Seventeenth and Eighteenth Centuries. The Collections of the National Gallery of Art Systematic Catalogue. Washington, D.C., 1996: 254-258, color repro. 257. Hand, John Oliver. National Gallery of Art: Master Paintings from the Collection. Washington and New York, 2004: 165, no. 124, color repro.